When I wrote last week about Erica Jong's essay on attachment parenting, a lot of people commented both here and elsewhere that one of the big problems in her article is that she confused attachment parenting with helicopter parenting. Certainly, the two are not the same. In fact, they belong on different axes altogether. While attachment parenting and helicopter parenting are different things, it doesn't mean that they never meet. There may be some attached parents who are also helicopter parents. But there are also plenty of attached parents who are not helicopter parents and plenty of helicopter parents who are not attached parents. But as I started writing that post, explaining the differences in parenting styles, I noticed a bigger problem. It became apparent to me that our society, in particular the media, like to put extreme parenting on display and then tear it apart. A friend of mine was supposed to be appearing on CBC's The National in a segment on what Canadian families eat, but in the end they were too "normal" for the show (not enough shock value for national television, I guess). Her experience, and the many, many articles and shows I've seen about parenting leave me asking: Why can't we celebrate the wide variety great ways that parents can raise a family, rather than victimizing those we perceive as "doing it wrong"? This diagram is intended to display how I think society perceives certain parenting styles and not necessarily how I perceive them. Let me break it down. "Good Mom": In the middle you have the smiling face of the "good mom". She is a little bit of everything and specifically all of the good parts of everything and none of the bad. Acceptable Parenting Styles: In the green area, you have the range of parenting styles that are accepted and celebrated. This includes being connected to your children, being involved in their lives and activities, giving them some room to explore via your "free range" attitude, and not forgetting your own ambition as you raise your children. Some parents tend more towards one or a couple of these and others aim for a mix of them all, but all of them are generally accepted. There is a lot of debate about which one is the best, but for the most part people in this "green" area are within the range of "doing it right". The Extreme Parenting Styles: In the corners, you have the parenting styles that society considers to be "bad". These are the ones you see on reality TV. These are the ones you see torn apart in newspapers and magazines. These are the parents that everyone likes to point their finger at. The martyrs never think of their own needs and let their children do anything they want. Their children will grow up to be selfish and disrespectful. The "smothers" are overinvolved and want to ensure that everything is absolutely perfect in their child's life and in their relationship with their child, but never give their child the opportunity to learn any independence. The neglectful parents probably didn't want to have children anyway and just don't care one way or another. They don't show their children affection or provide them with any support. The narcissistic parents are selfish and pushy and are looking to achieve their own goals vicariously through their children who are, of course, going to be the valedictorian, go on to be brain surgeons and also make a killing with their abstract art hobby. Our society rewards minor displays of any parenting style. Of course, sleep close to your infant (but not in your bed) and breastfeed for the first 6 months, but don't do anything ridiculous like co-sleeping with a four year old or nursing a toddler. Go ahead and let your child walk to school if you can see him the whole way there, but never ever let your child take public transportation alone. Help out with your child's school project, but don't write her college application for her. Insist on having a mom's night out once per week, but if you travel regularly for work you're taking it too far. The closer you are to the middle of the diagram, the more you will be patted on the back for being a "good mom". The further you move towards any of those extremities, the more likely you will be called a "bad mom". I am a big advocate for talking about what works and doesn't work in parenting. I enjoy looking at research, analyzing it, interpreting it, and pulling it apart. But I do not enjoy the polarization and victimization of parents that often results from putting certain parenting styles on display and making them look ridiculous. Society likes to turn parents into victims and the media enjoys fueling and exacerbating that. I love your diagram! 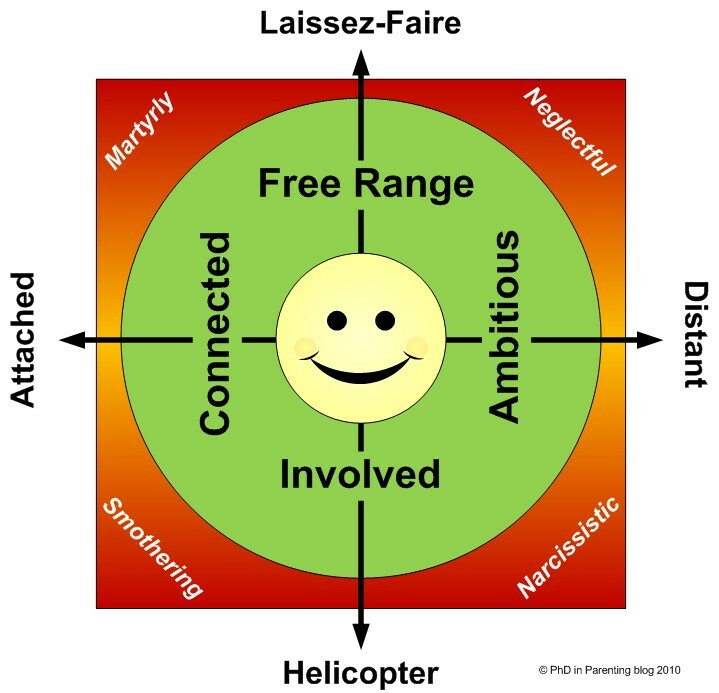 The thing (as I see it) is this... We all spend some time in the happy-face zone, some time in the "green" zone, and some time (however much or little depends on the individual, but WE ALL spend SOME time) in the no-no zone. Even if its just a minute or two once a day, a week, or a decade. Human beings are constantly changing. We really need to learn to just go easy on ourselves and each other. Nobody's perfect.... that's what makes us all so beautiful! I keep returning to this comment section to try to say something meaningful, and all I come up with is: I adore you. The only thing I'd add is that ALL of us, even smack dab in the middle, are at risk of being called a "bad mom". There is perceived safety, and a true reduction of risk, but there is no place on the spectrum -- there is no set of parenting choices -- that is guaranteed to save us from that criticism. We sometimes run toward the center, or attack those perceived to be at the extremes, in an effort to earn a "good mom" and ward off the "bad moms", but ultimately all that does is reify the dichotomy, perpetuate the marginalization of motherhood, and fuel media's frenzy over "the mommy wars". Of course, when someone is multiply marginalized already (which mothers basically are by definition, being women and having children), I don't blame her for running for what little safety the center can offer, when those on the edges are so viciously attacked. I only wish more of us would realize that doing away with the meme of the map and the media's complicity in its creation -- not our place on it -- is what we ought to focus our efforts on. Sometimes I wonder whether this whole ' which-parenting-style-are-you' obsession is a product of the affluent, low-fertility societies of the West. Is the 'opportunity costs' for women to start a family so great that 'we' feel the need to judge how successful we are in being mothers, and harshly compare one another in a multitude of yardsticks (indicators: organic made your own or bought baby food etc)? I agree with you, it is sad when one's parenting style is classified in a hierarchical manner, just like say, how different occupations are ranked in the international standard classification of occupations, and are used to explained wage outcomes! This is who humans are. I've recently watched some fairly major fights in a completely different community on a completely different subject with no media in sight, yet there was vicious stereotyping of people pushing them into the extremes and attacking them for things they hadn't said. It seems to be normal and natural for people to move around, as Arwyn said. And it's also normal and natural for us to assume there are people at the extremes and that they are bad, imposing our black on the shades of grey. I don't know if there is a way to combat it other than this - identifying it and discussing it, making us aware of our own tendencies so we can hopefully recognise them and choose not to do it. I love what you said about the media. I've had the same issue when it comes to postpartum depression. I'm often interviewed to appear on talk shows, but am too normal and recovered to be chosen. They want someone in the midst of hell, sobbing, ready to kill themselves or do some other such thing. I can't STAND that, because all it does it perpetuate the stigmas and stereotypes of women who have perinatal mood and anxiety disorders. We are everyday, normal women with an illness. Similarly, there are plenty of parents in the "green zone", but all you see are the extremes. And it's not just reality TV ... it's also the talk shows, the morning shows. For Pete's sake!! Sure, it is good to use what works from each style. And yeah, going to extremes is rarely helpful. But the way society sets up the diagram, it rewards and punishes moms at the same time for trying their best. What happened to society exacerbates the suckage as your closing line? Sheesh. >>The further you move towards any of those extremities, the more likely you will be called a “bad mom”. This may be true... but is it, perhaps, because, it's true? Maybe not in all cases, but I'd be inclined to say that the narcissistic or neglectful parent *is* less "good" of a parent than one who trends *more* towards the middle in parenting (you know I don't like using the terms good/bad, but for simplicity's sake...) or who takes a little from here, and a little from there. Too much of anything isn't good, and (if I'm remembering correctly from my long-ago psychology courses), kids mostly "turn out better" when their parents don't fall completely on one side of the Laissez-Faire - Autocratic leadership scale? Maybe the media, and society in general, when reporting on parenting styles is just responding to something that's already known - extremes aren't ideal? >>I am a big advocate for talking about what works and doesn’t work in parenting. Unfortunately, the always-present (unfortunate, and unnecessary) human need to feel better than the next person often is manifested by showcasing someone else's failures (think the awful shows like Super Nanny or Hoarders), instead of by taking a closer look at one's own issues and - through reading and talking and sharing about what works/doesn't work - taking steps to improve those issues. It's far easier to throw stones than to take a good look in the mirror. I agree with other commenters that we all, as parents, spend some of our time in the green circle and some of our time as far from the middle of your diagram as is physically possible. I don't think any of us WANT to be outside of that circle. It just happens. Work, sleep cycles, food, family, friends, life situations, hormones, etc. all contribute and work in tandem with our own personal parenting approaches and philosophies to put us at various points in the diagram at different times (sometimes at different times in the same hour!!). Thank you for the excellent summation!! How about I rephrase and say that we all spend some of our time in the YELLOW circle . . . Sorry. Maybe this next coffee will help me type and say what I mean! I find all of the discussion on parenting "styles" and "types" to be fascinating. Call me ignorant, but up until I braved the mommy blogosphere (months after my first child was born) I'd never read a parenting book, and never felt pressure to be one way or the other. Now I've come to feel comfortable associating with the AP tag, it's still not something I trumpet. I like to talk about what works, and why. I recognize that all children and parents are unique, in unique circumstances. But I've always been a bit hypersensitive to labels, being mixed-race, and while I recognize some people wear them proudly I do wonder why it's such a Big Deal. I blogged about a similar subject after I saw Discovery Health's "Radical Parenting", which featured three families, including The Feminist Breeder's. I missed her segment, but I heard it was portrayed as the most "normal". The other two segments were about unschooling and attachment parenting, and as someone who practices attachment parenting and is becoming more and more interested in unschooling, I thought the families came off as weird (and said so in my post). Elizabeth Parise, the attachment parenting mother, contacted me and blasted me for my post, and we've since become friends and realized how much we have in common. I think the green happy ground in your diagram is either much larger or much smaller than the media and we ourselves would believe. No one is really normal (green area small), but I tend to think that most people aren't really that extreme, either (green area large). Perhaps most of us really dwell in the medium happy ground, until we see accounts of ourselves edited into freaks in the media. I think that in most cases, extremes probably aren't ideal and I do think some of the extremes in this diagram are perhaps worse than others. That said, I don't think that there are very many parents at all who fall into those extremes. My concern is that when parenting styles are being debated or when they are being portrayed in the media, it is often the extremes that are discussed. So when people think of "attachment parenting" they think of the extremes that they have seen on TV or have heard their friends of friends talking about. When people think about "helicopter parents" they think about the parents who call up potential employers on behalf of their grown children and who arrive at work with them on the first day to help them set up their desk. I don't think that putting those extremes on display or pulling them out in a discussion on the merits of or problems with a particular parenting style is helpful. I think it just serves to polarize different choices even more. So, yes. Extremes might exist. Sometimes they might be bad. But I don't think it helps anyone to showcase them. I enjoyed your post but am most happy the headlines that read, "Super Nanny Retires." Sensational TV with an all behavioral base focus does nothing but harm - we know that children and parents are more than just behavior! And you're right, many families don't make the cut to be on the show because they are deemed as 'too' normal. Author, "The Go-To Mom's Guide To Emotion Coaching Young Children"
I totally agree with Lisa. Can we all just throw away the labels and philosophies and approches and just raise our children? In any given day I may make decisions that fall under every one of the parenting "styles." Or none of them. To me, parenting is way too complex a job to be classified into tidy little buckets. Good post. &: what Arwyn said. And also, to oversimplify, when I see anything approaching this mainstream discussion of unadulterated snark and shaming and old-fashioned meanness directed toward parents who've got male-junk between their legs, I'll give it some credit as being something besides about 89% lady (and child) hate (which stems from fear of both). I think the "What parenting style are you" comes from the media's obsession with using labels (which is an issue of affluent, low-fertility society). As women who were once girls who read "Are you popular/nerdy/musical? Take this quiz!" magazines, we learn that we are either this or that and nothing in between. We learn very early that the girl who loves animals is not the same girl who loves art and there's no room in the world for the girl who plays the trombone and wears glasses but also likes to bake and volunteer and be shortstop for her softball team. And then we grow up and we are either a helicopter parent or free range and you can't be both. You are so smart. This is what irritated me about the Jong piece (though she was so completely off-base I couldn't even come up with a rebuttal because it felt like arguing with somebody who doesn't speak the same language as you). We all pick and choose what works for us, we all spend time occupying different areas of the spectrum, and it's impossible to put somebody in a box and say "this is what kind of mother she is, and it means X Y and Z." Wow, you have a very structured way of thinking. We need that to put life in order here and there. It helps to see things more clear. I like your diagram and it looks like many others did too. It did really help when you said "read the rest of the post before you write your angry comments!" I feel I reach all corners of the circle (hey is that possible-corners in a circle ; ). I have learned a long time ago to honor the dark and the light sides to all life. I gave up being perfect before I was born. This is totally why I also kind of cringe when using labels like Attachment Parent or Natural Parent or Unschooler or whatever to describe my parenting. I do appreciate and follow some or most of the principles of these labels, but sometimes I don't. I think labels are certainly a human tendency, as is our habit of gawking at unusual stimuli (the extremes of parenting included), but it's too easy to judge and treat parenting philosophies like exclusive clubs when we get too attached to labels. Why focus on extremes, and tear down their instantiations? Because that's what culture does. Culture is a river, filled with stones. The stones knock against each other with the motion of the water. The sharp, protruding edges of each stone get knocked off, ground down, one at a time, until the stones are smooth. New stones are added, changing the course of the river and the height of the water, and so culture itself is changed by the addition of strong, extreme viewpoints away from the center. But the motion of culture is, like all motions, toward entropy. The issue of media companies sensationalizing stories is a different issue from the question of why we devalue the extremes. Their motives are monetary. That shouldn't take a diagram to demonstrate. So what you are really worried about is why culture itself derogates the extremes, and pillboxes parents, and yes, vilifies them when they are out of the happy green circle, and the answer to that is: because. Because that's what culture does. It's not normative, and its not purposive. It's entropic. I think you hit the nail on the head when you said that we're supposed to be all of the good and none of the bad. Which begs the question, who defines 'good' and 'bad'? Really? I think the need for 'good' and 'bad' is emblematic of the problem. Good and bad. Us and them. Right and wrong. The need to define the other gets us into so much trouble, and not just in parenting. In religion, in politics, in the workplace. I wish we didn't do this. But I catch myself doing it, and that makes me sad. We are all part of the solution, and part of the problem. And none of us hit an easily defined spot on any graph. I know you realize this, but I'm not sure everyone does. As someone who practices many things that are labelled extreme, I propose that it is not considered acceptable in our society to really think or care deeply about issues. When you learn and care, and discuss it or act on it, you automatically distance yourself from the centre core of apathy that makes our world what it is. Then you find that the energy of most people saved up by avoiding facing problems in the real world will be unleashed on you, the annoying outlier. The monkey pack will descend and tear you to pieces. The river filled with stones is a wonderful analogy. Unfortunately, people are not stones. Being banged into shape hurts. One of the most heartbreaking stories I ever heard was a mom asking my help in her dialogue with children's services. She breastfeed and practiced attachment parenting, and their idea of helping her out with a colicy, fussy baby had been to send someone out to tell her how to wean the baby, to relieve the stress in her life. When her baby and older child were taken in to care, she pleaded with them to tell her what style of parenting they wanted, since they seemed very much against hers, and their reply was something like, "Oh, you know, just normal." Breastfeeding and constantly holding and getting up in the night for an unhappy baby was not, in their minds, normal. From what she said, it sounded as if she was blamed for exhausting herself to the point of depression by needlessly nursing and carrying this baby. Criticism and negative labeling are bad enough to experience for any mother, but moms who need to work with a health or social services agency (or a school board) may find themselves really getting chewed up. Then the label of "bad mom" can mean: your children are coming with us. Being acultural can suddenly become illegal. I totally see the need to quantify what is going on in the world with parents and trends these days. The sad part is, we're all just moms surviving and we should be able to recognize our own reasons for parenting a certain way. Sometimes they are a good fit and other times they aren't. In my community, I see a lot of bullies in all corners. It's consumed my thoughts more days than not, about how it's become such a question of right or wrong. I see it this way - in our city it's the have versus the have-not. The green versus the plastic, and then this middle wishy-washy area. It's very interesting to follow, but I see far too many victims and parents who feel attacked or intimidated by a certain crew. Having been personally chewed up and spit out by the trendy moms, I can personally say that my parenting style has been a discussion between more than a few parents. I like your chart, though. It's been floating around my brain for quite some time as well. What a great diagram. You captured it to a tee and I so agree with your post. Fabulous! This problem is not only with motherhood and what is the best method, but it is with everything. The media for many years (and society in general) has focused on far extremes. It's 'more fun' to write about. We are taught to think that we can only be on one far side and that there is no middle ground. It is the same principal as the all teenagers are bad argument. Media focuses on the 5% of all teenagers that rob, steal, shoot people...or the one teen that figured out how to stop the world hunger crisis, plays soccer, and volunteers 80% of her time at the animal shelter. Therefor you are either volunteering at the animal shelter or you are outside robbing, stealing, or shooting people. Motherhood falls under the same principal with shows like the ones where the not caring parent switches families with the over protective parent. There is no middle ground. You are horrible for being protective (and liked by the protective side) or you are horrible for 'not caring' (and liked by the people who give their children space). Personally I don't think there should be that much emphasis placed on what group likes you or approves of your parenting style. You know what is best for your own child, and if the parenting style is that extreme the child will end up showing signs of neglect (yes both extremes are neglecting the child ) and the state will get involved. It is really nobody else's business what you do and they shouldn't argue about it to the point that people do. If you don't like what someone else is doing than just stop hanging out with them, and if you think it is that bad tell a caseworker at the DHS office. Don't make a scene about it. I honestly do not care who approves or doesn't approve of my parenting style. I know what my son needs and he is not falling behind for any of his milestones (he is 3 months old). As long as he stays on track socially, emotionally, and developmentally than I see no reason why I should change my style for anyone else's satisfaction. I think the diagram you came up with is a very useful visualization. As you hint at however, this kind of thing is usually too complicated for (mainstream) media. They don't only want "shocking", but also very much like to present simple answers to complex problems. Personally I think just listening to your inner voice, what kind of parent do I want to be, is more important than trying to precicely copy someone else's style. I'm really interesting in the UK approach to parenting and the victimisation of 'bad' parents. A colleague of mine went to a really interesting debate hosted by Parenting UK recently, haven't got time to fill you in on the whole discussion but you can read more here http://innovationunit.wordpress.com/2010/12/14/parenting-skills-in-the-eastenders-omnibus. I wondered if you were given £100 million to spend on a national parenting initiative what would you spend it on? I can't believe how well you nailed it. Every parent is different and we shouldn't judge. But that is just what the media wants us to - turn on each other. And we shouldn't fall prey to it. I didn't read your earlier piece, so I won't comment at length. But what I will say is that I think the larger problem is society's incessant need to assign labels to something that is inherently indefinable. Now two families are the same, and no two parents are the same. How I parent my children is arguably different than how my husband parents my children. The point being, what works for the individual is generally the right thing (barring extreme's of course). We would do well to ignore lables and support one another for the quality and richness of our uniqueness. Why is it so hard to accept that all parents are actually trying to do their best with the resources they have available? Even the ones at the extremes of parenting behaviour. If you have received a poor deal on financial, psychological, social, intellectual or emotional resources (among so many others) then your parenting might not be as effective as it could be, it could even be harmful, but that still does not mean that you aren't trying your best. Maybe if society can stop judging people's motivation we can start supporting everyone with resources that might be useful to them. Great post! I was so stress out in 2000 after my 1st baby was born. I feel the pressure to do everything right, but not what others were thinking was right just what I was thinking to be the right thing to do. So I can imaging feeling all the pressure form society and others parents, magazins and mommies blogs. However, the way you put it in the diagram is sooooo damn right. Thank you for a blog like yours and articles like this one, thank you for your writting, make me feel that there is hope, yes hope that one day we will be able to just feel that is ok to be normal, to make mistakes, to bounce for one corner to the other and still be normal. Sometimes listening to our inner instinc or voice is the best thing to do. Great diagram! While I don't think polarization of ideas is helpful, I do think it's helpful to compartmentalize these ideas for the sake of discussion. I'm a big fan of diagrams and visuals, so I really appreciated this one! As Kelly mentioned above, I do think that some of the extreme forms of parenting are pretty harmful to children. But you are right, that when discussions focus on those extreme versions, we lost sight of what might be positive about each of those parenting styles. Well, this is good for me to read write now. Yesterday my husband said I was being 'martyrly', and I was surprised. I feel that what I do is in the best interest of my daughter (10 months old) and that is how it should be. I am not a helicopter mom, but I am having a hard time finding balance. I will not leave my daughter to cry alone and I am feeling a bit overwhelmed by the sheer enormity of being responsible for the care and development of this beautiful soul. How do I maintain myself? I feel that this is just another area where things can go wrong - I am scared that I am going to go to far into one of these parenting styles - without realizing it. I know that there will be stress, but how do I manage it and stay in the 'happy face-green circle' area? Thanking God I found your site!
. I have been feeling very low today and in general for years because of the results of my largely narcissistic type of parenting. My husband and I have one daughter, the eldest, and two sons..my daughter, being the eldest, had it the most rough because neither my husband nor I knew what we were doing. Maybe this is wrong but in my estimation we did a low grade job trying to find out how to parent better. I agree with another's comment that stated most likely none of us spend all our time in the no-no zone..( even though I said my parenting style was narcissitic) . The typology chart you made is very helpful as well! It seems I fit in more than one typology, thankfully not neglectful nor heavily abusive, although not demonstrating very "good" parenting due to my own dysfunction. I ended up somewhat emotionally abusive especially to my eldest (a daughter) by being way to hard on her...I actually thought I was doing the right thing by not being a " push over " so my only excuse is that I really didn't intend to be emotionally abusive out of not caring...I cared..just didn't know what I was doing. Right now I feel more balanced after reading these two pages on your site. Growing up in a dysfunctional family with four older, very dysfunctional siblings, including two older and very critical sisters, I didn't get many good building blocks. My siblings loved me and each other but it turned out that the untreated dysfunction , along with a fairly large consumption of alcohol in the family and some temporary desertion of the family by my dad early on wreaked havoc in my family of origin. Two of my siblings never had kids and I think it was for the best, but the other three of us messed up plenty. I know you are not religious but God bless you for sharing, you a very generous. May 28, 2016 | Karen H.